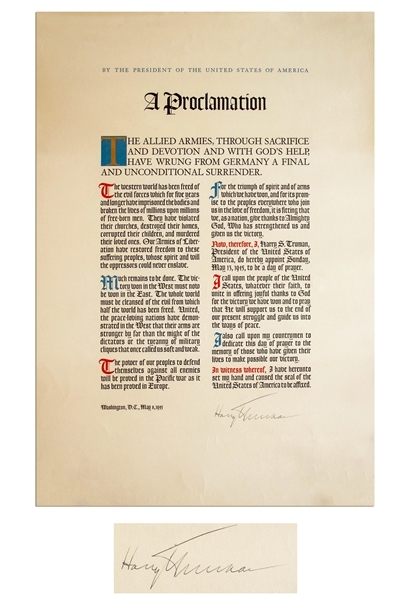 Rare V-E Day proclamation signed ''Harry Truman'' as President, given by Truman to his White House staff at the 1945 White House Christmas party. 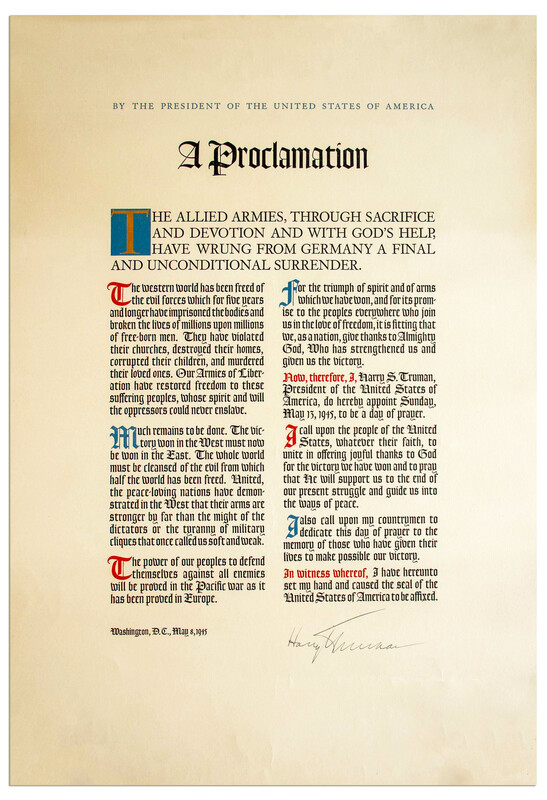 Dated 8 May 1945, printed document formally announces the Victory of Europe and surrender of Nazi Germany. 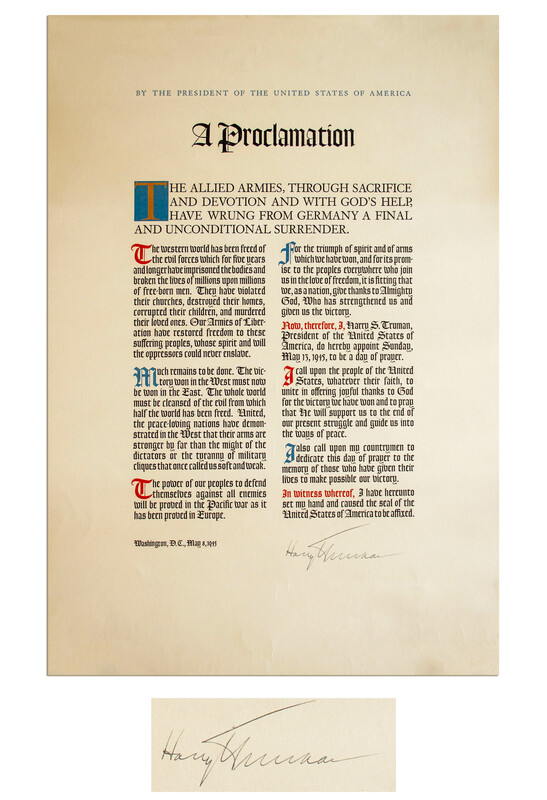 Text reads in part, ''The Allied Armies, through sacrifice and devotion and with God's help, have wrung from Germany a final and unconditional surrender. The Western World has been freed of the evil forces which for five years and longer have imprisoned the bodies and broken the lives of millions upon millions of free-born men. They have violated their churches, destroyed their homes, corrupted their children, and murdered their loved ones. Our Armies of Liberation have restored freedom to these suffering peoples, whose spirit and will their oppressors could never enslave...'' Single-page Proclamation is beautifully decorated in red, blue and gilt. Measures 14.75'' x 21.75''. Shallow crease to upper right and light buckling, but overall in near fine condition. 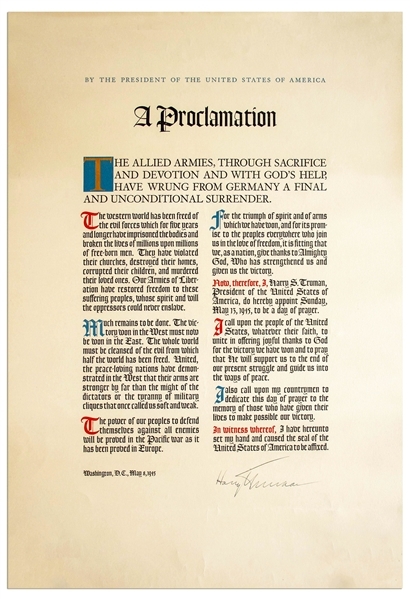 Proclamation is cited in the Seeley reference book as having been issued as a Christmas gift to White House staff in 1945, and one example remains in the collection of the Truman Library.